New York State Congresswoman Nita M. Lowey is currently serving her fifteenth term in Congress, representing parts of Westchester and Rockland Counties. She was first elected to the US House of Representatives in 1988 and served in the Democratic Leadership in 2001 and 2002 as the first woman and the first New Yorker to chair the Democratic Congressional Campaign Committee. She is also the first woman to lead either party on the powerful House Appropriations Committee. Few members of Congress have taken key leadership roles on so many vital public policy issues. Lowey is a leading Congressional proponent of educational opportunity, health care quality and biomedical research, improved homeland security preparedness, stricter public safety laws, environmental protection, women's issues, a leading international role for the United States, and national security. An outspoken supporter of transportation, nuclear, and infrastructure security, Lowey was appointed to the Select Committee on Homeland Security and recognized by the New York Post as “a key general in the battle to rebuild New York” for her leadership in securing over $20 billion for recovery efforts after September 11, 2001. Her efforts to distribute homeland security grants based on risk and to screen airport personnel in secure areas have been endorsed by The New York Times. Lowey has also helped to obtain more than $68 million in federal funds to develop local bioterrorism response plans and to provide local first responders with interoperable communication devices, rescue equipment, and personal protective gear. Lowey is a strong advocate for women, children, and families. She has been a champion of education throughout her career, fighting for school modernization, teacher development, and literacy programs. Under Lowey’s leadership, federal funding for after-school programs has increased from $1 million in 1996 to $1 billion today. 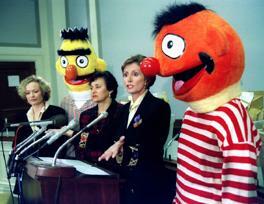 When GOP leaders threatened to eliminate the Public Broadcasting System (PBS) in the 1990s, Lowey "invited" puppets Bert and Ernie to a Congressional hearing. The resulting worldwide publicity is largely credited with saving the agency. When Republican leaders again targeted PBS for severe budget cuts in 2005, Lowey again successfully restored funding to the program. She has been equally stalwart in her defense of the National Endowment for the Arts (NEA) and served on the prestigious National Council for the Arts in recognition of her leadership. Updated: HHS Establishing Medical Shelter to Aid Those Affected by Hurricane Harvey: "Do Not Go To The Attic: Go To The Roof"